Fears around the stability of global banking systems combined with rising geopolitical tensions have led many people to re-evaluate the safety of their investments. One focus in particular is in seeking alternatives to fiat currencies. Cryptocurrencies, such as Bitcoin, are gaining increasing attention as an alternate store of value. But whether digital currencies can emerge as a viable and widespread alternative is still to be seen. Precious metals, gold in particular, are gaining attention as potential options for investment. And unlike the newly arrived cryptocurrencies, gold is a proven alternative to fiat currencies — a reliable and stable store of value, backed by a physical commodity. It protects against inflation and brings added diversification to your investment portfolio. There are plenty of reasons you may want to own gold, especially in today’s world. The increasing volatility of the stock market, along with widespread political instability and increasing economic worries, are all possible motives for holding at least some of your wealth in the safe haven of gold. The good news is that gold is no longer only available to the super rich who can store it in vaults. 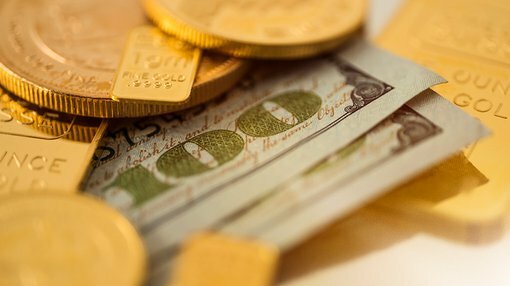 There are now a number of ways to invest in gold and they fall into one of two categories: physical gold, including gold bullion, coins and nuggets, or paper gold, like ETFs which act as a proxy for gold. Another option is to buy gold company stocks on the ASX or on overseas exchanges. Let’s take a closer look at some of the options available. If you like the idea of owning gold bars, this option is for you. Gold bullion is what most people think of when considering an investment in precious metals, but you don’t have to keep it physically in your possession. There are a number of gold dealers throughout Australia, including the Australian Bullion Company, the Perth Mint and ABC Bullion to name a few. Once you’ve purchased the gold you have a few options around how to store it. The bullion dealers can store it for you or you can rent a personal vault from your bank; alternatively you may prefer to purchase your own safe and store it at home. Like bullion, gold coins are another way to invest in the physical commodity. One benefit of gold coins over one ounce bars is that they can be held in small denominations. For example, the Gold American Eagle and Canadian Maple Leaf coins are produced in fractional sizes of less than one full ounce. These small denominations of 1/2-ounce, 1/4-ounce, and 1/10-ounce allow for easier transactions and don’t require you to transact in full 1-ounce lots. Rare or antique gold coins are another option, with some trading well above their value as a simple commodity. The problem here is that unless you’re well educated in this area you could end up paying a premium if a coin is worth more ‘in the eye of the beholder’ due to personal preferences or sentiment. Gold-based ETFs offer ASX-listed access to securities that are underpinned by gold holdings and move in tandem with gold prices. They can represent the cheapest and most convenient way to buy and sell gold. But they don’t come without a downside. Like all ETFs, gold ETFs provide indirect ownership and can leave a holder open to counterparty risk. That is, the risk that the ETF provider doesn’t hold up its end of the deal. For gold backed ETFs the problem is that the ETF provider doesn’t necessarily hold the physical commodity, but gain exposure to gold prices through futures, options, swaps, leases or other derivatives. That also means you don’t have the option to take physical delivery of the gold. While few investors want to take physical delivery due to the hassles and costs of storing it, the option brings peace of mind if you are worried about bank failures. And as a side note, if there is a rush to take physical delivery of gold, problems could arise. That’s because there is one hundred times more ‘paper gold’ being traded globally than there is physical mined gold. That may not be an issue in times of peace, but in the case of a global financial collapse, I’d much rather be holding the physical stuff – or at least have the option to take delivery of it. For this reason, it’s much safer to have the bullion in your possession, or at least have the right to collect the physical commodity if you so desire. One way of easily buying and selling the right to gold bullion on the ASX comes from the Perth Mint. The Mint sells gold depositary receipts that act just like an ETF, with the paper receipts linked to the underlying value of the gold. These depository receipts trade on the ASX under the code PMGOLD. A major attraction of these depositary receipts is that you have the option to take physical delivery of the bullion – and this is guaranteed by the state government of Western Australia. Another option is to transact though a gold-backed debit card. The Australian Bullion Company offers ‘gold savings accounts,’ which act much like a bank account but your money is converted into holdings in gold. A similar product can be found at Goldmoney.com. At Goldmoney.com you can buy small holdings of gold, and take delivery of gold just 1/10-ounce in the mail. You can transfer ownership of the gold to anyone, anywhere in the world for free. It comes with a debit card so the gold can be used in place of fiat currency to buy a coffee, or a new car. These accounts are the most similar to cryptocurrencies, with the difference being that they are backed by physical gold. Alternatively, there are hundreds of gold mining stocks to choose from on the ASX. Yet while they are leveraged to movements in the gold price, these companies will give you an entirely different investment exposure. You may find a place for them in your portfolio, especially if you know that over the past three years, the ASX All Ords Gold Index has performed significantly better than the ASX All Ords Index. Australia’s premier gold miner is ASX 200 company, Newcrest Mining (ASX: NCM). With a market cap of $17.9 billion, Newcrest is a well-established gold producer with operations throughout the world. Other large cap ASX gold plays include Northern Star Resources, St Barbara Ltd, OceanaGold Corp and Evolution Mining. Taking a look at the smaller and more speculative end of the market, there are a host of ASX-listed gold exploration companies. Empire Resources Limited (ASX: ERL) is a $10.2 million small cap explorer with two gold exploration projects in Western Australia. EHR Resources (ASX: EHR) is another ASX listed junior explorer which operates in a world-class gold mining region in Peru, with a market cap of just $6.6 million. Remember that buying gold stocks is far from being the same investment as investing directly in gold as a commodity. Investing in individual company stocks adds company-specific risks like poor management decisions, as well as sovereign risks of the country it is operating in. Gold is an often underappreciated investment, which protects your wealth in times of uncertainty and is a hedge against inflation. The good news is that there are plenty of avenues to choose from when looking to add gold to your portfolio.